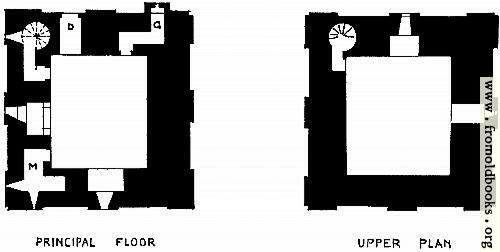 “The keep itself, which was built in 1176, is very similar in arrangement to the peel-towers of the Scottish border and to the towers which elsewhere formed the nucleus of many fortified houses. It probably represents the first step in domestic planning, and may be regarded as one of the earliest ancestors of the great houses of later centuries. Peak Castle is more commonly known as Peveril Castle.